CnetSDK .NET PDF to Image Converter SDK is a powerful PDF converter library DLL for .NET windows and web applications. This .NET PDF to image converter library component has full and advanced PDF conversion & rendering methods for you to accurately convert PDF to JPEG/JPG, PNG, GIF, BMP, and TIFF/TIF image files, including multiple page TIFF image. You will see a demo project in the downloaded trial package. It is easy to start! CnetSDK .NET PDF to Image Converter SDK is a complete and independent .NET PDF converter library for images, such as JPEG, JPG, TIFF, PNG and so on. It's quite easy to use. As long as your development environment is Windows System or an above version, .NET Framework 2.0 to 4.5, and Visual Studio 2005 or a later version, you can easily integrate our PDF converter library dll for your .NET application development, compatible with C# and VB.NET programming languages. 1. Please firstly download free trial package of .NET PDF to Image Converter online. 2. Choose the suitable PDF converter library dll for your Visual Studio .NET project. based on your system and .NET Framework. 3. Add .NET project reference to CnetSDK.PDFtoImage.Converter.Trial.dll. Now, all mature PDF to image conversion and rendering features are available for your VS C# or VB.NET project. The following .NET APIs and methods can help you to render, transform, and convert PDF to images for .NET windows and web applications. In details, you can easily load a PDF document from a file stream, memory stream or local file on your disk to Visual Studio .NET project, and then render and convert the whole PDF file, one PDF page, or a range of PDF pages to raster image file(s). By using .NET APIs and methods below, image size (width and height) can be customized in your .NET PDF to image conversion application. // Load a PDF document from a file stream or memory stream. // Load a PDF document from a local file on your disk. // Return the number of all PDF pages. // Render and convert specified page(s) of PDF to image(s). // Render and Convert specified page(s) of PDF to image(s) with certain image width and height. // Get width and height of certain PDF page(s). To help you have a quick evaluation of CnetSDK .NET PDF to Image Converter SDK, we provide an online tutorial for How to Convert PDF to Images for ASP.NET web application. Moreover, Visual C# and VB.NET sample codes for .NET PDF conversion to images are also provided online. Please refer to How to Convert PDF to Images C# Sample Code, How to Convert PDF to Images VB.NET sample code. We provide the free .net pdf render trial control online and you will find a demo project in it. 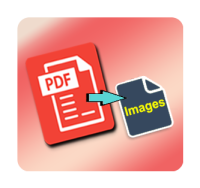 It is quite easy to convert pdf to image file. This .net pdf converter library can be used as a pdf converter to jpg/jpeg, .net convert pdf to tiff, .net convert pdf to png, .net render pdf to image, etc. You will learn how to render pdf to images, like how to convert pdf to jpg image, how to convert pdf to png image, how to render pdf to png, how to render pdf to tiff, and more.